Important Notice: Please report any problematic buyers or sellers so we can add them to the black list to our Facebook Page. Thank you! This auction system is designed to help allow more organized feedback within the BJD community. For this reason, we do not encourage private message deals as this will not allow you to leave feedback for the transaction. Please note that we are not affiliated with Den of Angels or any Facebook selling groups. Recasts: We are not allowing recasts for sale as there is too much controversy over them. Please see our Listing Guidelines for more specifics on what dolls are allowed on the Resin Market. A: Having an active, usable Paypal account is a requirement for Resin Market. Resin Market sellers and buyers use Paypal to send and pay for invoices, so having an active Paypal address is a requirement for registration. After you purchase a listing, your Paypal email will be provided to the seller for invoicing purposes. Q: Do I need a Den of Angels (DoA) Feedback page to sign up? A:We are not affiliated with DoA, however we do recommend having your DoA Feedback page on your profile, if you have one. This is not required for sign up. You can leave an alternate form of feedback on your profile as well. A: Using the menu above, select the ‘Create Listing’ option. This will take you to a page where you can select the duration of your listing. For the most part, the listing types are all identical, except for the duration of the listing. You can choose from 7 days, 14 days, or 30 days duration. For auctions, we recommend the 7 day duration for best results. 30-day duration auctions are more recommended for long-term sales. After selecting your duration, fill out the listing form to submit your item to the marketplace. Q: What currency is Resin Market in? A: Resin Market currently only supports making listings in USD, United States Dollars. More support for currency conversion will come up in the future. The use of USD in the listing and shipping fields are strictly enforced. We understand that it is difficult to have to switch to another currency if you are not currently using United States dollars. Until the system for other currency is released, please keep the prices listed in USD to prevent any confusion for your buyers/potential buyers. You may decide to communicate with your buyer via private message should you wish to invoice in another currency. A: There could be multiple reasons why you are unable to place a bid of a certain amount, but one of the most common reasons is that your bid is not above the minimum bid amount. Resin Market implements a minimum bid increment of $1.00. If the listing price is $5.00, you must bid $6.00 at least, for your bid to be considered. A: Resin Market uses a similar system as Ebay and many other auction sites. When you place a bid, your actual highest bid amount is hidden from the seller and other bidders, until someone else places a bid that is higher than your current bid. Your current bid will be bumped up each time someone else places a bid until it reaches your highest bid. If you place a bid and are immediately outbid, this means that your highest bid is lower than someone else’s existing highest bid, and you were immediately outbidded. Q: How does Resin Market handle payments? A: The quick answer is that Resin Market -DOES NOT- handle any payments. Resin Market provides the platform for the seller to reach a buyer via listings and contact methods like the messaging system. It is the buyer and seller’s responsibility to arrange for invoicing and payment after the listing ends. Resin Market assumes NO responsibility over any of the monetary transactions. All purchases placed through Resin Market are shipped directly from the selling party to the buyer party using the Resin Market platform, not Resin Market directly. Please contact the individual you are dealing with first with any order questions before reaching out to Resin Market directly. A: After a listing ends, sellers are provided with the buyer’s Paypal address they provided on registration. They are instructed to contact the buyer to confirm the final amount and invoice the buyer. Once the buyer pays the invoice, the seller ships the item and the transaction is complete. Resin Market highly discourages any transaction where payments are made as a personal gift for both the buyer and seller’s protections. A: Resin Market allows buyers and sellers to leave feedback after they have received their items or payment. You can do this buy either going to your buying or selling page, and finding your sold or purchased item. A: Buyers who reportedly pull out of purchased listings for no valid reasons will be recorded. Resin Market has a 4-strikes policy, and any buyers that commit an offense of non-payment four times over the course of a single year will be banned. 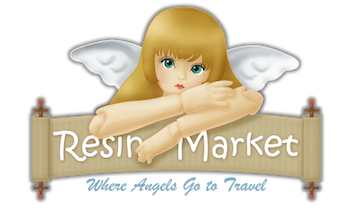 Resin Market has a no-tolerance policy against scammer sellers. Depending on the severity of the situation, Resin Market may ban any seller who commits such a fraud, even if it is a single offense. Any buyers or sellers that encounter scammers or deadbeats are encouraged to file a report immediately for the safety of the community. Resin Market also strongly suggests that any buyer dealing with a scamming seller to open a dispute with PayPal immediately. You only get 180 calendar days from the date of your PayPal payment to open a dispute, so be sure to do this if you have not heard from your seller. Please familiarize yourself with the PayPal buyer and seller protection. A: Our team of moderators consist of volunteers that are not compensated in any way for their time. We will do our best to get back to you in a timely manner.Emails will be responded based on moderator availability.